The Cadillac Automobile Company was formed by Henry Martyn Leland in 1902. The company, named for Antoine Laumet de La Mothe Cadillac, the French explorer who founded Detroit in the 1700s, emerged from the collapse of the Henry Ford Company, Ford’s second automotive effort, which was reorganized under Leland’s management. Cadillac was not originally a luxury marque. Its earliest models were powered by a 10 hp, one-cylinder engine, not much different in concept from Ford’s earliest runabouts. 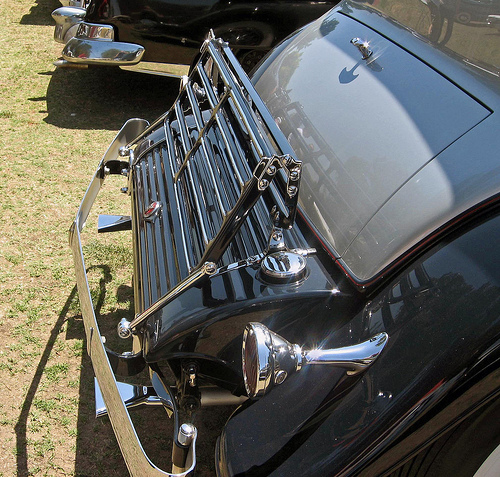 Thanks to Leland’s background as an engineer and machinist, however, Cadillacs were built with a level of precision uncommon in the early auto industry. Cadillac pioneered the use of interchangeable parts, a novelty in an age where most automobile repair was closer to blacksmithing. The company also introduced a number of other innovations, most notably the electric starter, developed by Charles Kettering in 1912. 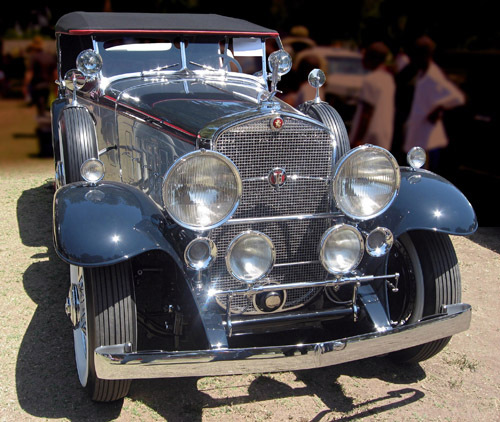 By the 1920s, Cadillac had moved into the luxury market, but it had yet to truly establish itself as a prestige make. There were many luxury car companies in America during the early twenties, many of them now forgotten, but the standard-setter was Packard. 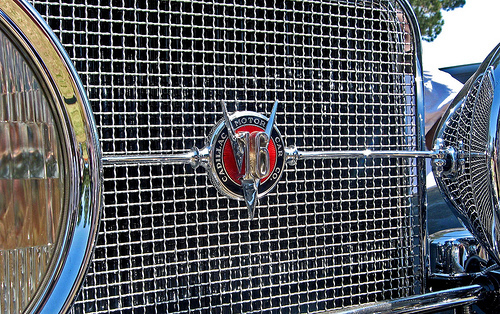 As much as Rolls-Royce (or, in later years, Mercedes-Benz), Packard was not only a fancy car, it was an instantly recognizable symbol of wealth and status. Anyone could make an expensive car, but creating something as prestigious as a Packard was another matter entirely. In 1925, Lawrence P. Fisher, Jr. became Cadillac’s new president and general manager. Fisher was also one of the principals of the Fisher Brothers Body Company, a highly successful Detroit coachwork firm in which GM had acquired a controlling interest in 1919. (In 1926, GM acquired it outright, and transformed it into the Fisher Body Division.) A flamboyant and ambitious businessman, Fisher wanted Cadillac to meet Packard on its own terms. Fisher’s first step was to boost Cadillac’s bottom line by adding a smaller companion make, the LaSalle, to which end he hired a young stylist from Hollywood named Harley Earl. Next, Fisher set out to create a new flagship, a car that would take Cadillac into the most elite levels of the luxury market. Fisher felt Cadillac’s existing V-8 engine had neither the power nor the sense of occasion for the task. In 1926, Fisher hired Owen Nacker, previously a senior engineer at the Indianapolis-based Marmon Motor Car Company, as the new head of engine development. At Marmon, Nacker and Howard Marmon had discussed the possibility of the ultimate “multicylinder” engine: a V-16. The engine apparently was only in the conceptual stages when Nacker left Marmon, but it was exactly what Fisher had in mind. Various automakers, including Daimler, Hispano-Suiza and Delage, had V-12 engines, but not even Bugatti had a 16-cylinder car. To ensure that its impact would not be diluted, the Cadillac V-16 was developed with a level of secrecy more befitting a new military aircraft than a car. As a cover, the engine was described as a V-12, not a V-16, and even within Cadillac, all paperwork described it as a coach or bus engine. In truth, Nacker was also working on a V-12 as a follow-on to the 16-cylinder car sharing many of the same parts and tooling, but few outside Nacker’s engineering team had any idea of what they were actually creating. It went almost without saying that the new Cadillac V-16 would be big. In the twenties and thirties, the only reliable way to produce more power was greater engine displacement. Contemporary metallurgy, lubrication, and cooling systems limited maximum engine speeds; 4,000 rpm was a lofty speed for most engines of the time and sustaining such speeds was courting disaster. Increasing compression ratios was also impractical. Despite the advent of leaded gasoline, developed by Charles Kettering a few years earlier, available fuels did not have the octane rating for compression ratios much above about 5.5:1. Mechanical superchargers offered exhilarating short-term power increases, but most were noisy and temperamental and had the potential to destroy an engine in short order. Large-displacement engines had their drawbacks, including bulk, weight, and fuel consumption, but they were by far the safer choice. One drawback with engines of very large displacement is that as the displacement of each cylinder grows, so too does its potential for harshness and vibration. Each cylinder in a four-stroke engine fires only once every 720 degrees of crankshaft rotation and the cylinders do not fire at the same time. The power stroke of each cylinder pushes the engine in a different direction, creating what are called coupling forces. Depending on how the cylinders are arranged, those forces cause the engine to shake in one or more directions. The bigger the cylinders, the greater the forces generated by each power stroke, and the greater the resultant shaking. The ideal solution was to add more cylinders, allowing a generous total displacement, but keeping each individual cylinder relatively small. Adding more cylinders also increases the frequency of the power strokes, which serves to damp the vibration of each individual cylinder. All else being equal, an eight-cylinder engine is smoother than a four, a 12 is smoother than an eight, and a 16 is smoother than any of the others. A multicylinder configuration has other advantages as well. It allows the stroke of each piston to be kept relatively short, reducing internal friction. Even with a two-valve-per-cylinder design, it also increases the engine’s total valve area, improving volumetric efficiency. Its principal drawbacks are complexity and fuel consumption. An engine’s efficiency is reduced by pumping losses, the energy expended to draw air and fuel into each cylinder and expel the exhaust; additional cylinders mean additional pumping losses. A big 12- or 16-cylinder engine is frighteningly thirsty, although in those pre-OPEC days, fuel economy was not a major concern for luxury car buyers. Styling of the Cadillac V-16 cars, supervised by Harley Earl and heavily influenced by contemporary Hispano-Suiza, is racy for its era. This 1931 Special Phaeton looks far more low-slung than it actually is, thanks to the rakishly tilted windshield — other body styles had upright, one-piece windshields. Cadillac’s “tombstone” grille was retained through 1932. The new Cadillac engine was a 45-degree V-16, essentially two straight-eight engines sharing a common crankshaft and crankcase. Since each cylinder fires once every 720 degree of crank rotation, the 45-degree angle between the cylinder banks gave even firing intervals (the ideal angle for a V-8 engine is 90 degrees; for a V-12, 60 degrees). Its bore and stroke were modest, 3 inches (76.2 mm) and 4 inches (101.2 mm), respectively, giving an overall displacement of 452 cubic inches (7,413 cc). This was hardly the biggest engine in the business — the Bugatti Type 41 Royale had a monstrous 778 cu. in. (12,763 cc) straight-eight, while Hispano-Suiza’s 1931 V-12 was 575 cu. in. (9,425 cc) — but it was comfortably larger than Cadillac’s existing 353 cu. in. (5,791 cc) V-8. More to the point, it was bigger than Packard’s 385 cu. in. (6,306 cc) straight eight or Duesenberg’s 420 cu. in. (6,884 cc) eight. Unlike Cadillac’s V-8 engines, which were flathead designs, the Cadillac V-16 had overhead valves (see our article on the Oldsmobile Rocket 88 for more on the distinction between flathead and OHV layouts). It used hydraulic valve lifters to eliminate valve clatter and had fully machined combustion chambers. The Cadillac V-16 was a truly massive engine, weighing around 1,300 pounds with all accessories. As a concession to the poor quality of contemporary fuel, it had a compression ratio of only 5.35:1. It was initially rated at 175 gross horsepower (131 kW), although it was quickly restated as 165 hp (123 kW). Both numbers were certainly conservative, since the V-16’s dynamometer tests would have justified a gross rating closer to 200 horsepower (149 kW). None of those figures is impressive today, although they were a substantial improvement over the 90 horsepower (67 kW) of the Cadillac V-8. More important was the V-16’s torque output, 320 pounds-feet (433 N-m) at only 1,200 rpm, which ensured that it could lug along uncomplainingly at very low speeds in top gear. It was astonishingly smooth and refined, with a silky power delivery that was not matched by any other engine for many years afterward. The chassis of the Cadillac V-16 was appropriately grandiose, stretching 222.5 inches (5,651 mm) on a 148-inch (3,759-mm) wheelbase. Its engineering was not complex: a heavy platform frame with solid axles, suspended on semi-elliptical leaf springs like a 19th-century carriage. 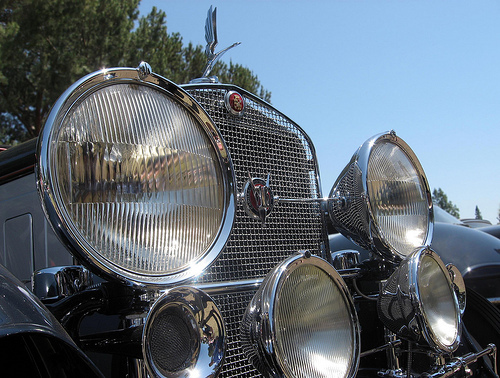 It had mechanically operated brakes (Cadillac would not adopt hydraulic brakes until 1936), and power steering and automatic transmission were still years in the future. Other than the engine, the principal mechanical innovation was the three-speed Synchro-Mesh transmission, introduced on Cadillacs the year before, with synchronized second and third gears. It made shifting relatively painless, although with the V-16’s massive torque, top gear was satisfactory for most situations. Most of what we would consider luxury equipment was not yet available, but a heater was optional, as was a radio. In-car radios were still in their infancy, and the installation was complex and troublesome. About 80% of Cadillac V-16s built had closed bodies, which makes surviving open cars, like this 1931 special phaeton, especially prized. A “phaeton” (named for the son of the Greek sun god Helios) was originally a sporty, minimally bodied carriage with oversize wheels. In automotive terms, it meant an open car with an extended couple (the distance between the front seat and the rear axle) for additional seating. About 84 examples of this body style were built by Fleetwood, of which 18 are believed to survive. The sidemount spare tires were an extra-cost option, as were the rear-view mirrors mounted on them; the latter cost about $32. 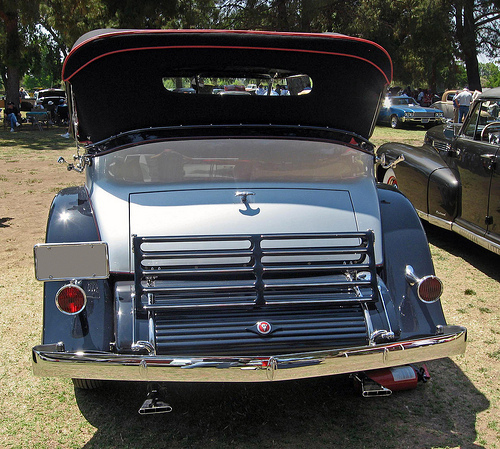 Many luxury cars of the era had custom bodies built by outside coachbuilders to the customer’s specifications. Duesenberg, for instance, offered no off-the-rack bodies at all, presuming that any customer able to afford one of their cars could also afford bespoke bodywork. As part of General Motors, Cadillac had access to two “captive” coachbuilders, Fisher Body and the Pennsylvania-based Fleetwood, which Fisher had acquired in 1927. Most Cadillac V-16s had “factory custom” bodies by either Fisher or Fleetwood, based on a few basic body types: two-door coupes, two- and four-door convertibles, four-door sedans, and town cars. Individualists could also — for an extra charge, of course — mix and match the various elements to create a new combination not in the catalog. Failing all that, you could order a bare chassis and send it out to the coachbuilder of your choice, although very few customers actually did so. Interior choices were nearly as voluminous, with the Color Book listing 40 different interior-trim selections and a broad assortment of paint and upholstery color options. All early Cadillac V-16s rode the same chassis, with a 148-inch (3,759-mm) wheelbase (increased to 153 inches (3,886 mm) in 1934). With the top up, it stands fully six feet (1.83 m) tall. This body style, which had the catalog number 4260, has curved “coach” sills (note the way the sill curves upwards just behind the sidemount spare); other bodies had horizontal sills. This model originally cost $6,150 without accessories, which was raised to $6,500 in October 1930. It weighs around 6,000 pounds (2,725 kg) with a full tank of fuel. With so many choices, it’s inevitable that many of the cataloged styles were produced in very small numbers, making some Cadillac V-16 cars literally unique. The most common choice was the seven-passenger Le Baron sedan, which cost $6,225, less shipping and accessories. The most glamorous were the dozen or so “Madam X” variations, taking their name from Madame X, a highly successful 1929 film based on the Alexandre Brisson play. The least expensive choice was the two-passenger, rumble-seat roadster, which cost $5,350; the most expensive was the seven-passenger town brougham, which ran to $9,200. In 1930, the price of any of these cars would buy a very nice house in many parts of the country. Despite the huge engine, the Cadillac V-16 did not offer sports car performance. The lightest of the cataloged bodies weighed well over 5,000 pounds (2,275 kg) with some topping three tons (2,725 kg). Some of the lighter-bodied cars were said to be capable of 100 mph (160 km/h), but for most, 80-85 mph (130-135 km/h) was probably the limit. It mattered little, except for bragging rights, since there were still very few roads where it was possible to sustain such speeds. Fuel consumption was at best 8 mpg (29.4 L/100 km). To its credit, the V-16 proved to be a reliable, durable engine, far less finicky than many of its more exotic foreign rivals. As you can see, rear vision with the top up is not a key attribute of the phaeton body style. Note the narrow exhaust pipes; while they’re too restrictive for maximum engine output, they make the Cadillac V-16 uncannily silent at idle — shortly after these photos were taken, your inattentive author was nearly run over by this very car because we didn’t hear it coming. (The car was almost as quiet as a Toyota Prius at low speeds.) 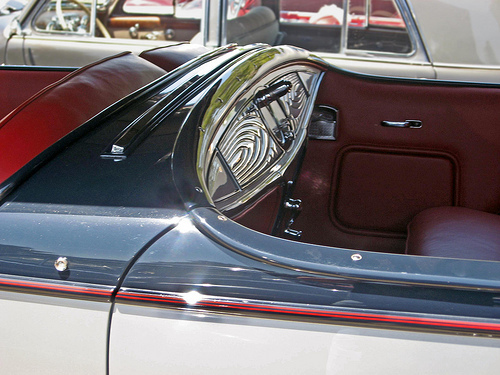 The rear compartment is intended for the standard spare tire, although most cars (including this one) had the optional sidemounts. The tire compartment isn’t really big enough for luggage, except perhaps a few oddments. Despite the Cadillac V-16’s gargantuan dimensions, most luggage had to be carried on an external rack like this one, which was a pricey, $140 option. That did not include the actual trunks, which ran between $100 and $119 extra. The combined price would have purchased a decent used car in 1931. After nearly four years of clandestine development, Larry Fisher finally announced the new car in a letter to Cadillac dealers on December 10, 1929. It declared that there was nothing in the world to compare with the new Cadillac, which he described as the pinnacle of exclusivity and style. 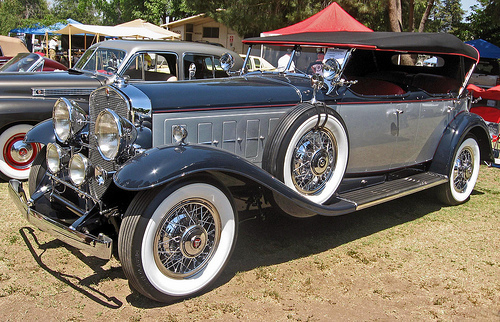 The Cadillac Sixteen made its formal debut at the New York Auto Show on January 4, 1930. The phaeton body style’s massive top is a cumbersome affair, the raising and lowering of which was best left to the chauffeur. The tiny silver studs on the tops of the doors are snaps for the isinglass side curtains; phaetons did not have wind-up glass windows. It will not escape students of history that the Cadillac V-16 bowed barely two months after the dramatic stock market crash of late October 1929. Despite the crash’s ominous economic implications, however, the Cadillac V-16 proved to be a sensation. A thousand were sold in the first four months of production, a small number by Chevrolet standards, but impressive for such an expensive car. Total sales for its short 1930 model year were 2,887. 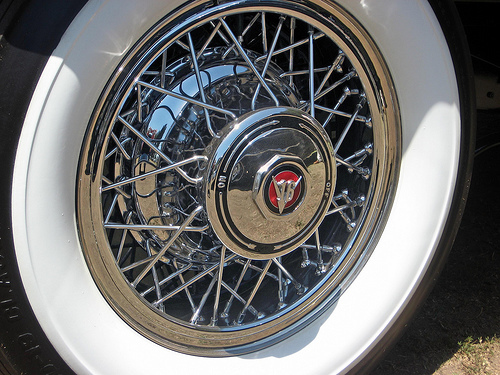 For traditionalists, Cadillac still offered wooden artillery wheels, but demountable wooden wheels, disc-type steel wheels, or these lovely 19-inch knock-off wire wheels were optional, the latter for $70 extra. Behind them are a set of enormous 16.5-inch (419mm) drum brakes. Four-wheel brakes were a relatively recent innovation, added to Cadillacs in 1924. The Cadillac V-16 was followed by a host of multicylinder rivals. The Marmon V-16, which had been delayed by development problems and Marmon’s 1926 financial crisis, finally debuted in October. Although it was an impressive, all-aluminum engine that exceeded the Cadillac in both displacement (491 cu. in., 8,044 cc) and power (200 hp, 149 kW), it was overshadowed by Cadillac’s earlier debut. 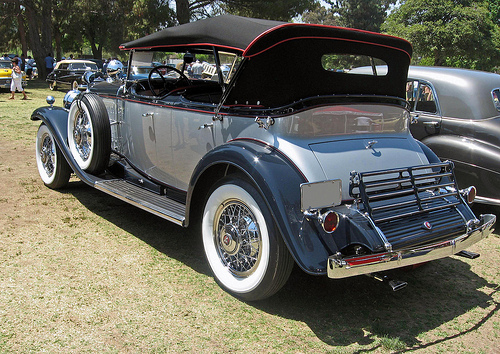 Only 390 Marmon 16s were built before the company went into receivership in early 1933. Packard, meanwhile, responded with a new Twin Six, which arrived in the spring of 1932. Before long, Lincoln, Auburn, Franklin, Pierce-Arrow, and even Rolls-Royce had new V-12 engines, although no other automaker matched Cadillac and Marmon with a V-16 of their own. 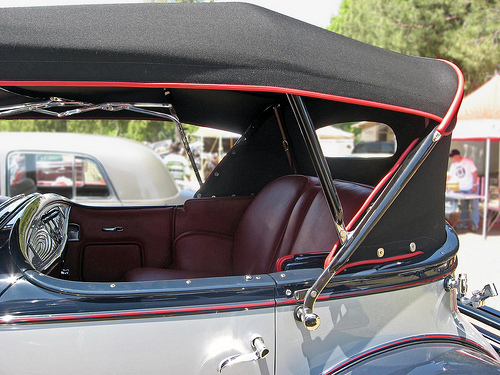 The Cadillac V-16 special phaeton is a “dual-cowl” phaeton with a second cowl separating the front and rear seats. The rear seat has its own windshield, which can be cranked up to keep the wind from mussing Monsieur and Madame’s coiffures at speed. There was also a single car built with a folding rear windscreen instead of the crank-up version of the special phaeton. 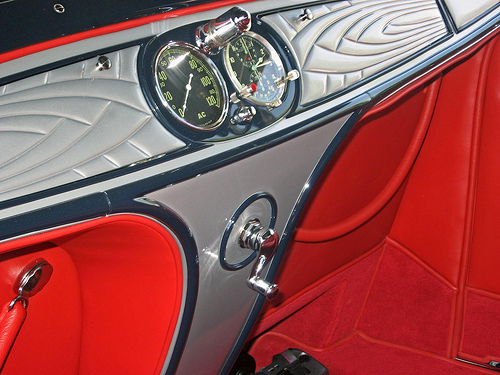 The special phaeton’s rear cowl is also fitted with its own speedometer and an elaborate Jaeger eight-day clock. The crank handle is for raising and lowering the windscreen. The cords hanging beneath the dash are robe rails. The optional lap robes were appreciated on chilly days, but they were not cheap; $80 each, if you please (around $1,100 in today’s dollars!). By the fall of 1930, Cadillac V-16 sales had slowed considerably. Production of the nearly identical 1931 models fell to 364 units, dipping to 296 for the 1932 model year. Contrary to popular belief, it was not the worsening economy that put the brakes on V-16 sales — although that would come soon enough — but the introduction of Cadillac’s own V-12, which was announced at the end of July and went on sale in October 1930. In Part Two, we’ll look at the Cadillac V-12 and the fate of the multicylinder monsters. Our sources for these articles included Dennis Adler, Speed and Luxury: The Great Cars (Oceola, WI: MBI Publishing Company, 1997), pp. 58-63; the Auto Editors of Consumer Guide, Encyclopedia of American Cars: Over 65 Years of Automotive History (Lincolnwood, IL: Publications International, 1996); John Barach’s Cadillac History site (1999-2008, Motorera, www.motorera. com/ cadillac/index.htm, accessed 5 December 2008); Arch Brown, “Regal Ragtop: 1935 Cadillac V-12 Fleetwood Convertible Sedan,” reprinted in The Hemmings Motor News Book of Cadillacs: driveReports from Hemmings Special Interest Autos magazine, eds. Terry Ehrich and Richard Lentinello (Bennington, VT: Hemmings Motor News, 2000), and “SIA comparisonReport: Battle of the Behemoths: Cadillac V-16 versus Marmon V-16,” Special Interest Autos #106 (July-August 1988), pp. 24-31, 59-60; Arch Brown, Richard Langworth, and the Auto Editors of Consumer Guide, Great Cars of the 20th Century (Lincolnwood, IL: Publications International, Ltd., 1998); John Steele Gordon, “The Man Who Saved the Cadillac,” American Heritage, 20 July 1995, www.americanheritage. com, accessed 5 December 2008; Maurice D. Hendry and Dave Holls, Cadillac: Standard of the World: The Complete History, Fourth ed. (Princeton, NJ: Automobile Quarterly, 1990); Beverly Rae Kimes, ed., Standard Catalog of American Cars 1805-1942, Second ed. (Iola, WI: Krause Publications, Inc., 1989); Wilfred Leland, Master of Precision (Chicago, IL: Wayne State University Press, 1996); Samuel B. Malin, “The Cadillac V-16—Some Notes on Its Design,” The Michigan Technic Vol. 43, No. 4 (January 1930), pp. 10, 40, 48; Alan Merkel, “Where Did All the Sixteens Go?” Special Interest Autos #106 (July-August 1988), pp. 32-35, 64; Yann Saunders’ Cadillac Database (2001, www.car-nection. com/ yann/Dbas_txt/indx2001.htm [now www.cadillacdatabase. com], accessed 4 December 2008) and Glossary of Terms, 12 December 1999, www.car-nection. com/ yann/Dbas_txt/Fact_ndx.htm [now www.cadillacdatabase. com], accessed 17 January 2000); Norman F. Uhlir, “History of the Cadillac V-16 1930-1940,” Motor Trend January 1965, pp. 78-83; Rob Wagner, Classic Cars (New York: MetroBooks, 1996), pp. 20-28; and Richard Wright, “Industry History Chapter 10,” The Auto Channel, 1996, www.theautochannel. com, accessed 5 December 2008). Information on Cadillac’s postwar V-16 and V-12 came from the Auto Editors of Consumer Guide, “Great Expectations: Cadillac’s Postwar V-12 and V-16,” Cars That Never Were: The Prototypes (Skokie, IL: Publications International, Ltd. 1981); Roger Huntington, “It makes sense…New V-12 for Cadillac,” Motor Trend Vol. 17, No. 9 (September 1965), pp. 70-71; Richard M. Langworth, “Cadillac’s Colossal Postwar Multi-Cylinders: V-12s and V-16s for the Sixties? Well, maybe…” Special Interest Autos #64 (August 1981), pp. 24-29; Karl Ludvigsen, The V-12 Engine: The Untold Inside Story of the Technology, Evolution, Performance and Impact of All V-12-Engined Cars (Sparkford, Yeovil, Somerset: Haynes Publishing, 2005); and Daniel Strohl, “Success! Cadillac’s OHC V-12 engine photos found,” Hemmings Blog, 14 April 2010, blog.hemmings. com, accessed 19 October 2010. I want to tell you that you have a grest web site. I have an original trunk for a 1930s cadallic. The outside is in great shape and has the original emblem and the inside has all original covering. I would like to find out what this trunk would be worth. I’m afraid I don’t know — my suggestion would be to look at publications like Hemmings or contacting the Cadillac-LaSalle club for help. Sorry! Very good. Thank you for your article. Automotive technology has changed less then thought, as we are still building upon old ideas. Proof reading and excepting correction in form is good and smart. Again Thank you very much. The V-16 has a vacuum assist on the cable brakes which works on the vacuum from the engine intake manifold, this vacuum is shared with the wind shield wiper motor.The vacuum is taken from both the left and right intake manifold. The engine has two vacuum tanks to draw fuel from the tank through separate fuel lines. This system gets vacuum from an engine driven vacuum pump located between the cylinder banks at the end. There is also an electric fuel gauge. The ignition key has a mechanical transmission lock so if you did not have the key you could hot wire the car but not put it in gear to drive away. The foot starter lever first engages the drive pinion with the flywheel ring and then a further press to the end of its travel, energizes the starter motor for a silent engagement. It has an enclosed drive shaft (torque tube) to the rear differential. if you cut one side fuel supply, you cannot tell that half the cylinders are not firing unless you went to the exhaust tail pipes and felt the hot and cold exhaust. It is the smoothest engine ever and surprisingly quick throttle response showing a light flywheel. Thanks for the info! I knew there was a vacuum assist, but not how it worked. The original V-16 was indeed a remarkably smooth and quiet engine. I saw the photo car in motion shortly after these pictures were taken and was astonished by how quiet it was. Can someone tell me the color of the oil pan on a 1933 Cadillac v-16?Im building a 1/16 scale model of the car, and the oil pan is molded in aluminum color.I question whether this is correct or not. Thanks for the help, Joe. As far as I’ve ever seen, it is. If someone has a more authoritative response, let us know. Thanks for this excellent precis on the Cadillac V16. I learned a lot, and I still have a lot to learn from you. I don’t sell parts, so I’m afraid I can’t help with that. At this point, I imagine that finding a complete example of either Cadillac V-16 would be quite a challenge, assuming you weren’t able/willing to spend big bucks on a complete V-16 car and then pull its engine! I have Marmon v 16 distributor cap that has never been installed or fired. Any response will be appreciated. Would you happen to know their top speed and gas mileage? Or new advancements that later came, if any? Top speed varied quite a bit depending on body style and axle ratio — the median was around 90 mph (145 km/h). Fuel economy varied likewise, but from what I’ve read, a rough estimate for cruising economy would be 8 to 10 miles per U.S. gallon (say, 23 to 29 liters per 100 km if you’re thinking in metric terms.) Obviously, with a half-ton difference between some body styles, it undoubtedly depended on which model you were talking about. Great story; but you forgot one very well engineered feature. The 452 Cadillac V-16 had a very simple yet effective automatic hydraulic valve lash adjustment that totally eliminated any rocker arm noise. I gre up with a 452 V-16 Special Phaeton. Superb car. I did mention the lash adjusters briefly, in the paragraph beginning, “Unlike Cadillac’s V-8s…” although I didn’t get into how they work, which was kind of neat in itself. I realize I did omit another minor detail that I just added, which is that the combustion chambers were fully machined after casting. A very expensive engine, to be sure, but Cadillac was certainly determined to ensure that you got your money’s worth under the hood! I’m sorry, I can’t help with valuation — I have absolutely no idea, although I imagine someone would be interested in them (as wall decorations if not for actual restoration). the v-12 and v-16 over head engine has a roller lifters, alum push rods to the (if i remember correctly)rockers that are 1 rocker 2 round tubes inside the rocker arm an is the quoit hydraulic lifter. the adjustment is done while the engine is running done by ice pick with 90 deg bend on the tip of the pick witch is inserted in a indent on the side of one of the tubes of the rocker. The quiet is really remarkable. Most cars of that period are not what you’d call quiet; they aren’t necessarily objectionably loud or rough, but you can always tell you’re dealing with a mechanical device. The V-16’s whisper silence is really something.